Business email through Gmail Get business email addresses with your company name (you@yourcompany). You can also create group email aliases such as sales@yourcompany. Video and voice conferencing Meet face to face with your team using easy-to-join HD video calls. Connect up to 25 people within or outside of your organization with a simple, shareable link. Shared calendars Use shareable calendars to easily schedule meetings with teammates. Calendar integrates seamlessly with Gmail to respond to events, Drive to attach files, and Hangouts to have video conferences. Documents, spreadsheets, and presentations Create and edit text documents, robust spreadsheets, and beautiful presentations across devices. Share files with teammates and work in the same file at the same time. No more version control issues or emailing files back and forth. 24/7 Support directly by Google Call or email Google support to get help from a live person whenever you need it. You can also find fast answers online in our help center. Security and administration controls Easily add users, manage devices, and configure security settings so your data stays safe. Security options like 2-step verification, mobile device management, and SSO are included. 30GB cloud storage Use Drive to keep all your work files in one secure place with 30GB of cloud-based file storage per user. Access your files whenever you need them from your laptop, phone, or tablet. Unlimited cloud storage (or 1TB if fewer than 5 users) Use Drive to keep all your work files in one secure place with unlimited cloud-based file storage (accounts with fewer than 5 users get 1TB per user). Access your files whenever you need them from your laptop, phone, or tablet. Smart search across G Suite with Cloud Search Search across your company`s content in G Suite, from Gmail and Drive to Docs, Sheets, Slides, Calendar, and more. Cloud Search answers your questions and delivers relevant suggestions to help you throughout the day. Archive and set Retention for Emails and Chats Control how long your email messages and on-the-record chats are retained. Specify policies for your entire domain or based on organizational units, date ranges, and specific terms. eDiscovery for emails, chats, and files eDiscovery is the process of searching and retrieving information in electronic format. It is useful for legal matters and prevents data loss from employee turnover. Audit reports to track user activity Use Vault to track user activity. Robust audit trails let you see searches, message views, exports, and more. Data loss prevention for Gmail Prevent leakage of sensitive data, such as credit card numbers, via emails. Set up policy-based actions to notify the admin, add warnings to message headers, or block emails from being sent when sensitive content is detected. Hosted S/MIME for Gmail S/MIME (Secure/Multipurpose Internet Mail Extensions) is a standard method for sending digitally signed and encrypted email messages. Add S/MIME signatures to outbound emails to make them more secure. Integrate Gmail with compliant third-party archiving tools Meet complex email compliance requirements by integrating Gmail with a compliant third-party archiving tool of your choice. Enterprise Grade Security key enforcement Admins can require security key usage to log in to G Suite, preventing other less secure methods of access. Gmail Log Analysis in Big Query Seamlessly access Gmail logs in BigQuery to run sophisticated, high-performing custom queries, analyze your data, and build custom dashboards. Create, edit, and collaborate with others on documents hosted on the cloud. Enjoy real time editing with all the latest review and text editing features! Build, edit, and review spreadsheets online with all your stakeholders using this robust, feature rich editor. Data manipulation, reporting and sharing is now easy! Now you can move partial users to Google without changing the DNS with our Dual Delivery eDiscovery Module. 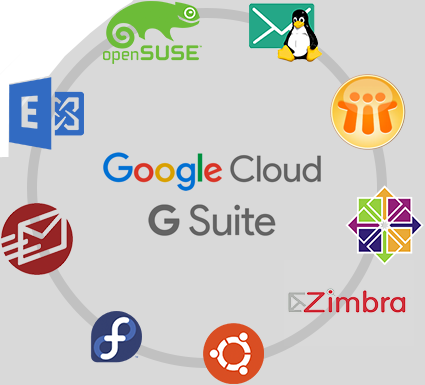 You do not have to change your MX to point all the users to Google, you can keep your Existing Exchange, or Lotus Domino, or MDaemon or existing Linux based Email server and only move fewer users to G-Suite.